Week 2 of our study has come and gone! It's flying by. I've really enjoyed this week, but to be honest, I wasn't wholeheartedly into it earlier in the week. There were a couple of days when I got behind or realized I hadn't read my Bible yet, and it was totally obvious in my attitude and words to others. Isn't it crazy how big of a difference a little bit of Jesus in the morning makes in our lives? We learned about Elohim last week. This week, we moved onto El Elyon, which means "God is sovereign." I've heard that word over and over in my Christian life, but never really grasped the concept of what it really means to me. Sovereign: possessing supreme or ultimate power. In a world where we have no control over anything really, it is so comforting to know that God is sovereign in our lives. He is our one true constant in a world that is ever-changing, and I don't know about you, but that gives me a lot of peace, especially when it feels like all else is failing. The passages that stuck out most to me were the ones about Job (Day 8.) 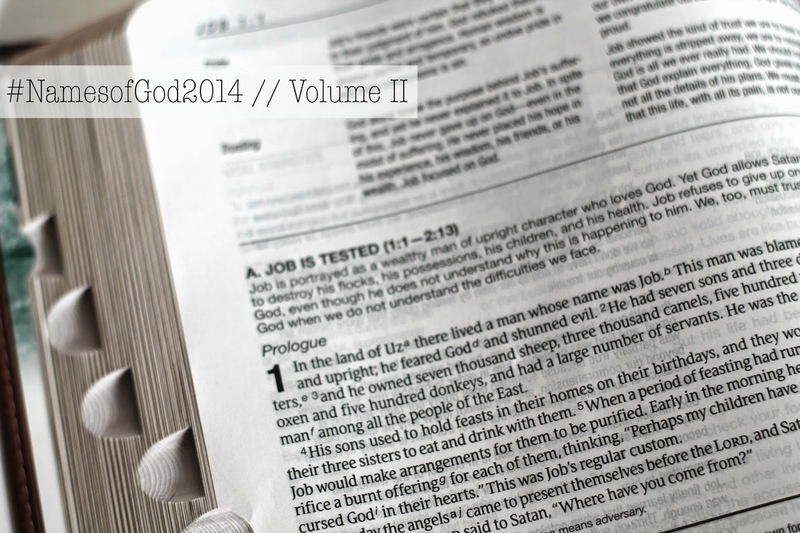 I can't remember the last time I read his story, and although I know a lot about Job, I never read it in the perspective of God allowing Satan to turn his world upside down. And this brought to mind a question that we as Christians hear a lot, from non believers or even Christians who have had calamity strike--Why would a God who is all-good, all-knowing, and all-powerful allow bad things to happen to good people? Actually, I think Job was the first one to ask this, bless his heart. He didn't have it so easy. Something that I learned a long time ago is that the Bible makes it quite clear that our faith in Jesus never ensures us a life of leisure, that everything will be easy. I wish I knew an answer to why suffering happens, but I know one day, it will all be clear to us on the other side of heaven. I know that suffering makes me depend on the Lord more, makes me long for heaven. I always depend on Romans 8:28, "And we know that in all things, God works for the good of those who love Him." It never says we'll see the good immediately or even in this life--we only see things dimly in this world. And this promise isn't made to everyone--only to those who are committed to following Him. I love what Arthur said about El Elyon...something that I've read and read over again. After we studied El Elyon, we moved onto El Roi. Before this study, I had never heard of El Roi. Sure, I know that God is omnipotent but I never knew that was really a name of the Lord. The God who sees. I can't see all or know all or understand all, but God can. God does. It's hard for me to grasp that sometimes, but that's what faith is all aboutI think the story of Hagar is applicable to all of us, maybe not exactly like it happened to her, but we've all been in a situation where we were made to do something we didn't want to do, whether at work, in a friendship, with a family member, etc. Sometimes we don't know why, but we can rest in the fact that God sees and knows all the aspects surrounding our circumstance. That gives me peace. I love looking at El Roi as God sees--especially when it comes to the hard things, like infertility, struggles in marriage, strained friendships, abuse, and all of those hard things in life that are too hurtful or shameful to talk about out loud. God sees. God knows. God is there in the midst of it, even when we feel like we're alone. That brings tears to my eyes, because of His faithfulness, He never leaves us. He's always in the midst of our pain, loving us enough to show us the good in it.